J.L. Torres’s novel may concern itself with the patria, but it’s the women who drive the heart of this millennial-diasporic book. Rennie Falto, a 20-something DiaspoRican adrift in Puerto Rico after the death of his staunchly Nationalist parents, is our troubled protagonist. Having lost them to a terrorist bombing in Israel, he flies their bodies back to their native Puerto Rico and learns to love this strange, foreign land. The Accidental Native hits the ground running with Rennie already mourning by their graveside on the island. There he meets Julia, the birth mother he never knew existed, and has to contend with a university plagued with secrets tied to the United States military, a villainous administrator who sees him as Other, and squatters occupying his parents’ home. Torres’ first full-length novel veers between a fish-out-of water story, a thriller, and a history lesson, weaving together Puerto Rico’s past, present, and future. Rennie is struggling to come to terms with his identity as a Puerto Rican in Puerto Rico. A very different Puerto Rican protagonist, he’s from a privileged, middle-class, educated background. Torres gives us a fully rendered character that combats the usual stereotypes the dominant culture has of Puerto Ricans and Latina/os, one that also works actively to fight against the stereotypes Puerto Ricans have of each other, Island-born verses U.S.-born. The framework Torres uses to examine Rennie’s uncomfortable space between Puerto Rican and ‘American’ is wonderfully rendered by the relationship he explores with Julia. She is a politically active, powerful and well-known attorney and she’s determined to be a mother now that Rennie has been orphaned. She considers it her duty to indoctrinate Rennie into the independence movement and give him a greater understanding of the history of the island, his history. At times the book stalls. There’s too much story to tell and not enough space and time in which to tell it. Though the multiple storylines of Rennie’s acclimation to island-life and culture intertwine appropriately, it’s hard to feel as if the reader gets as much from these multiple threads as they could if the book were expanded or Torres chose to focus on one or two of the storylines exclusively. For a novel about a Puerto Rican man figuring out his place in the world, the text is surprisingly feminist and filled with strong, complicated, female characters. Puerto Rico may have its own machismo problem, and Rennie has his moments, but it’s clear from Torres’ novel that the island culture, and the independence movement is indebted to las mujeres. The book has a sense of humor, and Torres throws the over-confident and dismissive Rennie into a few sticky situations to highlight that fact. Rennie’s relationship with the department chair at the university, Roque, who’s out for his head, is intensely confrontational and serves to highlight the disconnect between island-Ricans and DiaspoRicans. It’s hard to imagine Puerto Ricans considering each other “foreign”, based solely on where they were born. What happened to Boricua hasta en la luna? Yet, it’s a dynamic Torres actively seeks to blow wide open. What’s especially interesting, considering the forces Rennie is caught between, is the way his romantic life blossoms in Puerto Rico. He is drawn to another ‘displaced’ Latino, the Cuban-by-blood, U.S-by-birth, Puerto Rican-by-acculturation Marisol. She’s particularly intrigued by the ways in which Rennie’s not a “typical” Puerto Rican man. It is Marisol and Julia who push Rennie to combat the university’s cover-up of buried munitions on campus, which may or may not be making faculty sick. It is in this endeavor that Rennie embraces being Puerto Rican, and begins to forgive Julia, finally seeing her as his mother. Rennie Falto is a Puerto Rican character for the new millennium. His U.S. background is most evident in his musical taste and his total confusion with the political and gendered dynamics he encounters. For those of us exploring what it means to be a Puerto Rican, especially in the third-generation, Rennie offers a youthful character wholly different from the Piris and the Nildas. An English-dominant, college-educated, stateside born and raised Boricua, the U.S. is his home, and it’s Puerto Rico he needs to learn to adjust to. The Accidental Native represents a new phase of Puerto Rican literature, giving us a character that rebels against the usual and challenges what it means to be Puerto Rican, and the proscribed ways in which to be a Latino. It’s a new trend I’d like to see more of. 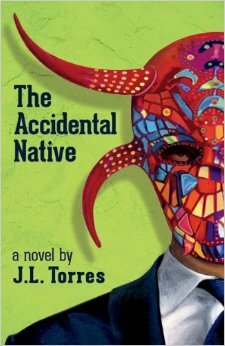 The Accidental Native is published by Arte Publico Press, a Latino/ Hispanic-focused press based out of the University of Houston and founded by Nicolas Kanellos. J.L. Torres is professor of English literature at SUNY Plattsburgh. He has published a book of short stories, The Family Terrorist and Other Stories, and is co-editor of Writing off the Hyphen: New Perspectives on the Literature of the Puerto Rican Diaspora. He is currently at work on another collection of short stories, and a semi-biographical novel of Roberto Clemente’s life.